Gunnison locals known for their diverse original music and unwavering energetic live performances will be hitting the Black Box theatre with gusto! 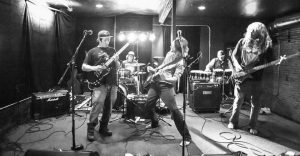 Barefoot’s sound has been likened to musical roots saturated in Indie Rock, Alternative and Grunge with a taste of Latin Rhythm, Blues and Funk to round out their repertoire. This performance will be one colorful experience one does not want to miss! Tickets: $12/general admission, $10/members, students with ID.